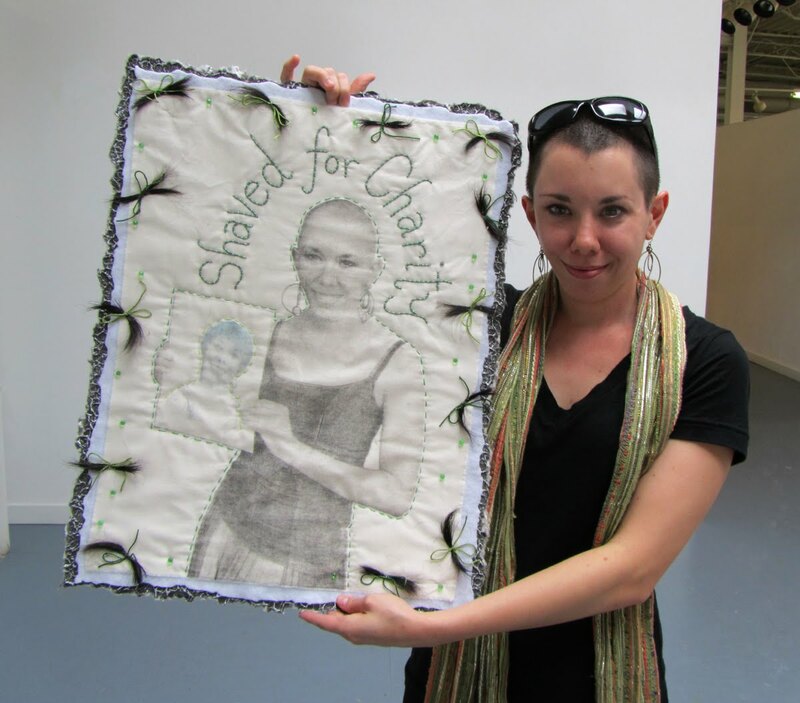 Jillian Owens created a most amazing recycled garment from ex-boyfriends' shirts for Runaway Runway last April. I was impressed with the concept and the craftsmanship. We became Facebook friends right after the event. Her Facebook posts her counting the days until her head was going to be shaved for the St. Baldrick's Foundation, a group dedicated to raising funds for kids with cancer. Jillian doesn't even know one of these suffering children; she's just generous....and BRAVE. I had to witness this decision! I had to secure it for the Decision Portrait Series. We exchanged messages. Jillian was happy to participate in my art! 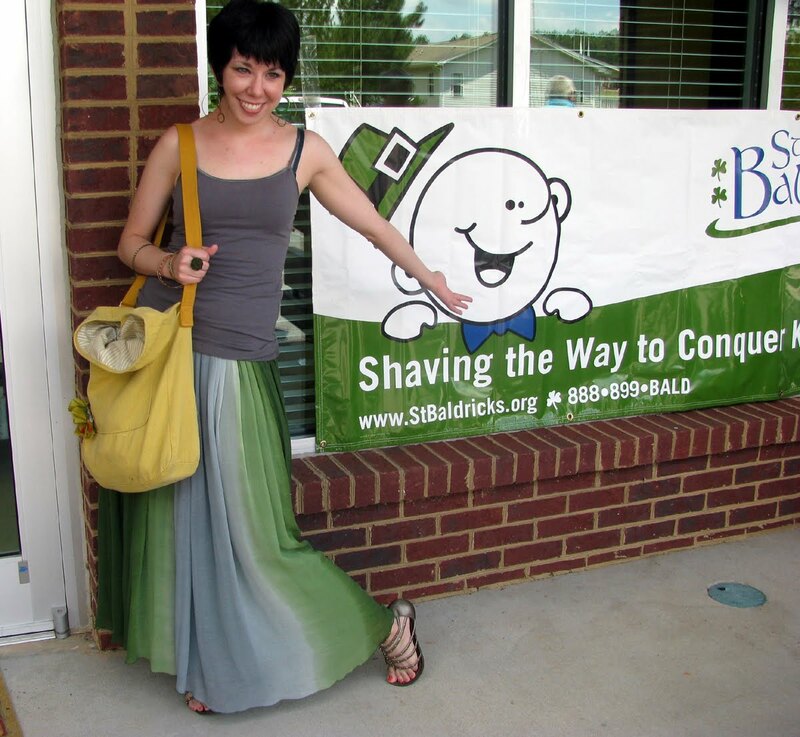 On May 29, 2010 I went to a chic hair salon in Chapin, South Carolina where I finally met Jillian, her boyfriend Marty, Ivan (from the St. Baldrick's Foundation), Jon Osbourne (the "stylist"), and others willing to have their heads shaved for charity. IT WAS AMAZING! I'm not vain about much in my life. I own no make-up, don't dye my hair, buy my clothes at local thrift shops, and my nails are a mess....but THERE'S NO WAY I could do this! Watching Jillian's thick black hair fall to the ground, section by section, was eye-opening...stunning. Watching the combination of emotions on Jillian's face was inspiring. What courage! What generosity! Jillian signed my "model's release". 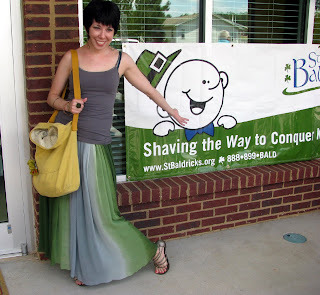 She posed for both "before" and "after" photos....including ones in which she was holding up a blank piece of paper. Videos were shot. 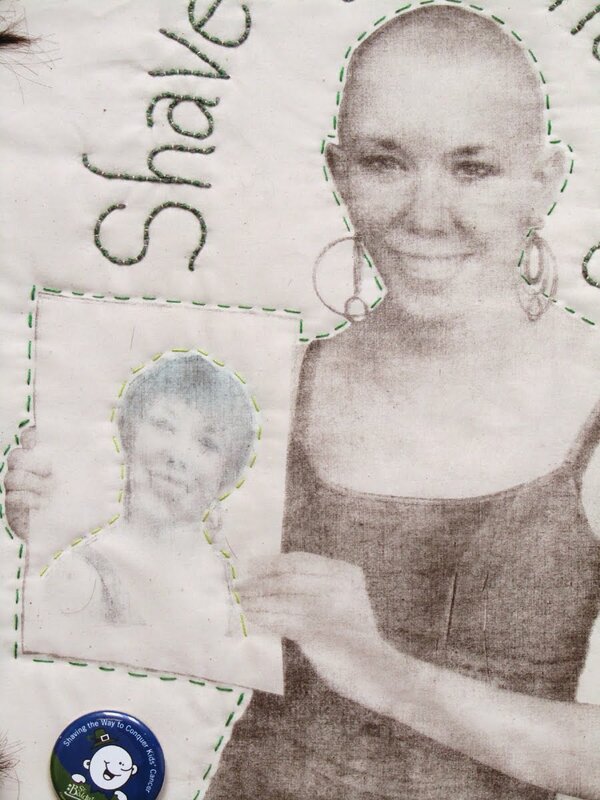 I used a photo of Jillian holding the blank paper and superimposed a "before" photo during the transfer process. 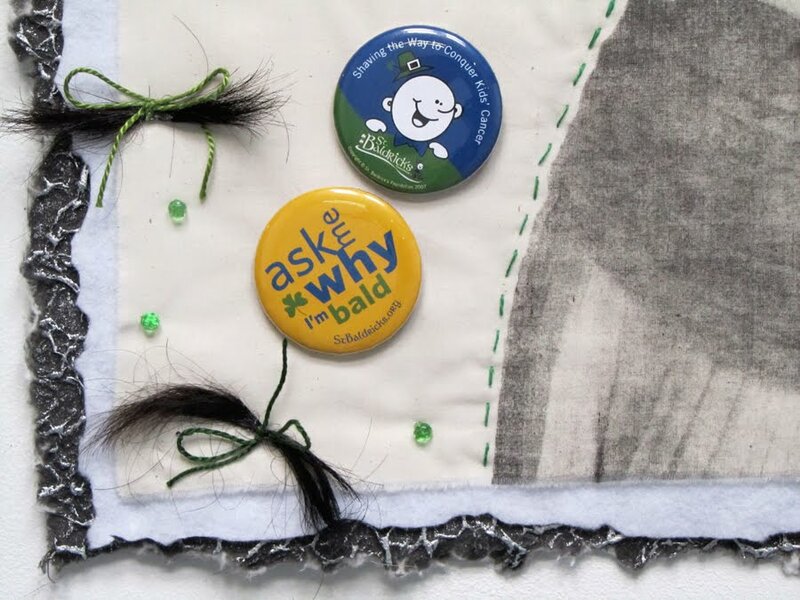 Jillian agreed to donate her "Ask Me Why I'm Bald" and "St. Baldrick's Foundation" pins to the portrait. 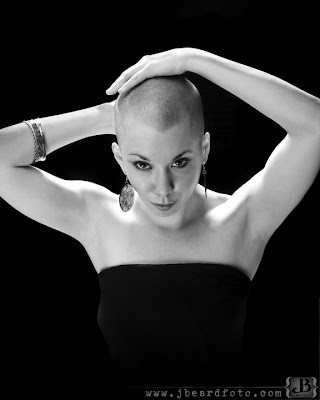 Later, she posed for more professional photos, like this one by Joshua Beard.....now bald really is BEAUTIFUL. 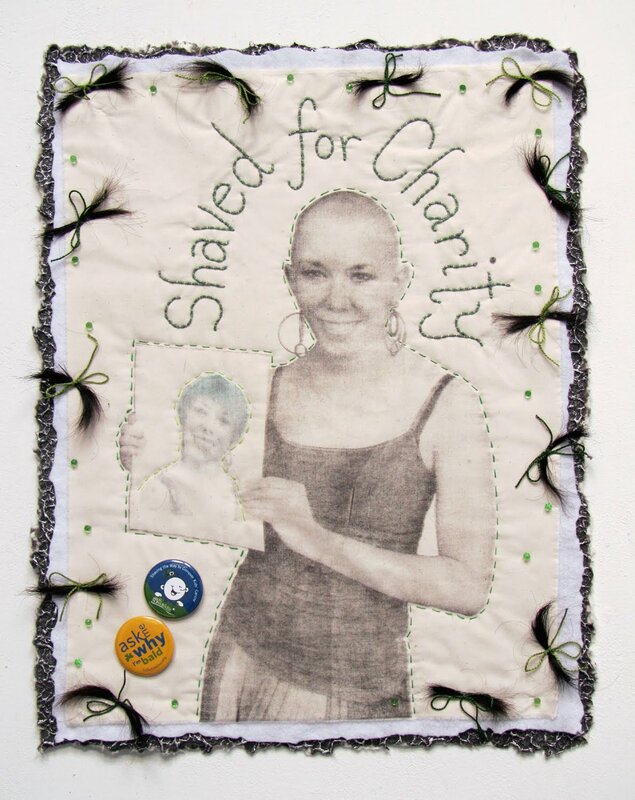 I collected Jillian's hair after the "shaving" and made unique "attachments" for the portrait using a tab of gel medium and a short length of perle cotton. The green glass, jewel-like bauble beads were ones I'd wanted to use for ages but no beading needle would slip through the impossibly small hole. In Washington, DC I found #15 beading needles....smaller than those generally found in a 4-pack at fabric shops. These little gems must have been waiting for "something special".....for THIS PIECE. It really is unique. Jillian's decision can be seen in a video I made HERE. Jillian really is beautiful, inside and out. This is fabulous. God Bless people like Jillian. 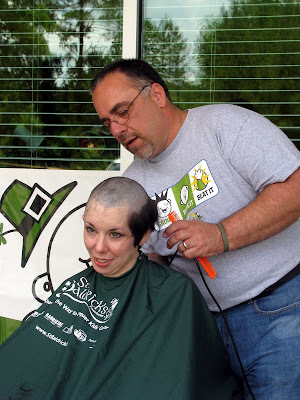 I had to do this and it was tough, can't imagine offering to do it for a cause. 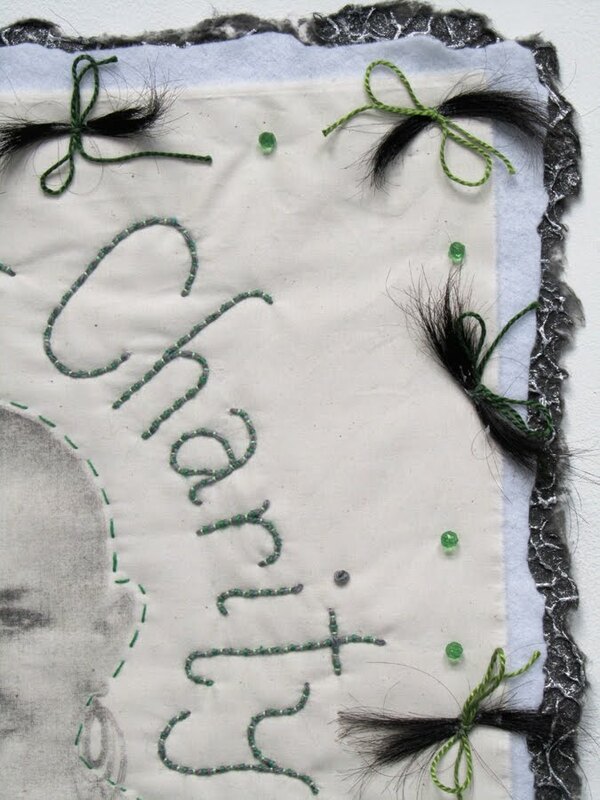 The piece is very thought provoking with all of the pieces of hair. Did I tell you I saved some of my hair??? ?